(Nanowerk News) Two-dimensional (2D) materials such as graphene have unique electronic, magnetic, optical, and mechanical properties that promise to drive innovation in areas from electronics to energy to materials to medicine. Columbia University researchers report a major advance that may revolutionize the field, a “twistronic” device whose characteristics can be varied by simply varying the angle between two different 2D layers placed on top of one another. In a paper published online today in Science ("Twistable electronics with dynamically rotatable heterostructures"), the team demonstrates a novel device structure that not only gives them unprecedented control over the angular orientation in twisted-layer devices, but also allows them to vary this angle in situ, so that the effects of twist angle on electronic, optical, and mechanical properties can be studied in a single device. The answer, the Columbia researchers realized, was to take advantage of the low friction that exists at the interface between the layers, which are held together by van der Waals forces that are much weaker than the atomic bonds within each layer. This low friction – which makes 2D materials very good as solid lubricants – makes controlled assembly at a desired angle very difficult. The Columbia group used the low friction characteristic to their advantage by designing a device structure in which, instead of preventing rotation, they could intentionally and controllably vary the rotation angle. 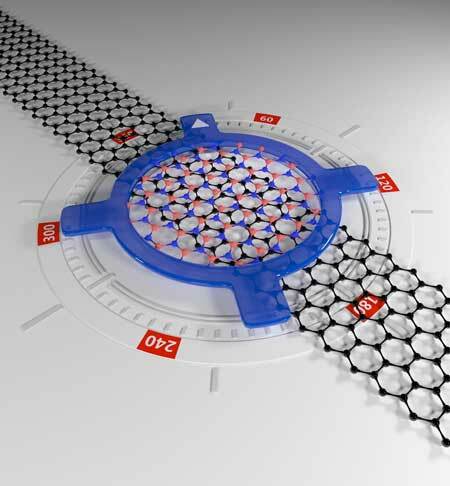 The team used graphene/boron-nitride heterostructures to demonstrate the reach of their technique. In these structures, when the layers are not crystallographically aligned, the materials preserve their original properties (e.g., graphene will have a semi-metallic character) but when the layers are aligned, the properties of graphene change, opening an energy gap and behaving as a semiconductor. The researchers showed that this fine-tuning of the heterostructure’s properties affects its optical, mechanical, and electronic responses. From a technological point of view, the ability to tune the properties of a layered material by varying the twist angle provides the possibility for a single material platform to perform a variety of functions. For example, electronic circuits are built from a finite number of components including metallic conductors, insulators, semiconductors, and magnetic materials. This process requires integration of a variety of different materials and can pose a significant engineering challenge. In contrast, a single material that can be locally “twisted” to realize each of these components could enable significant new engineering opportunities. Dean and Hone are now using their new technique to study other combinations of 2D materials in which the properties can be tuned by angular alignment. They are looking particularly at the recent discovery of superconductivity in twisted bilayer graphene and exploring whether it may be a general feature of twisted bilayers made from arbitrary 2D materials.